DITCH THE CABLE! 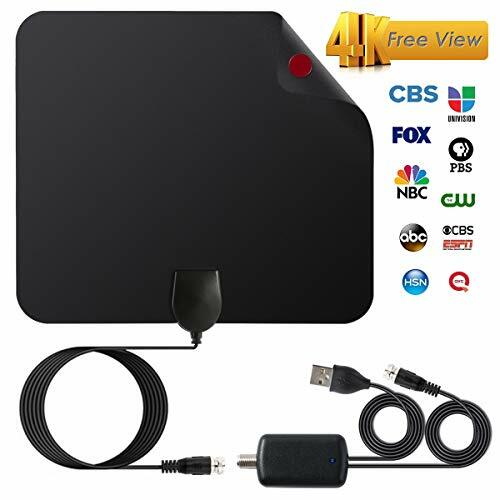 2018 Upgraded HDTV Antenna Just $9.09! 【Free for Life】Never pay hugely expensive cable or satellite fees again! Get access to your local news, weather, sitcoms, kids and sports programs, educational programs etc., Receives free broadcast High Definition Over-the-Air TV signals such as ABC, CBS, NBC, PBS, Fox, Univision and others. Enjoy crystal clear HDTV shows, 720p, 1080i, 1080p, 4K | ATSC available. This antenna is compatible with all types of TV converter boxes and digital televisions/4K Ultra High Definition TVs. 【High Performance Reception】2018 Newest Amplifier Signal Booster! Which update 5%-10% reception than old version. 60-120 Miles signal reception range, equip with new type switch control amplifier booster. Choose to use it or not according to your distance to the tower easily. Below 35 miles? Turn to the short range side! Above 35 miles? Turn the green light on! 【Long Coaxial Cable】16FT Long coaxial cable for easy installation! Your TV is far away from the best spot for signal reception? No problem! With the long cable that is a piece of cake. And USB power supply is more suitable for modern life! 【Ultra-Thin & Easy To Use】Slim, soft and lightweight design allows you place it almost anywhere and no power required. Moisture and lightning protection to TV antennas promise you enjoy hundreds of Crystal Clear Digital & HD shows even in thunderstorms. 【Lifetime Warranty】HotCat think highly highly of every customer, and will try our best to win your satisfaction! Don't worry about our quality! 90 Days Full Refund and Lifetime Warranty with friendly customer service. Any issues with reception or bad signaling feel free to contact us and get a refund or replacement . We are pretty confident about the quality of our antenna that is why it comes with a lifetime warranty.